Carried out a full shop refit at 2020 Vision, opticians. This job we took four weeks from start to completion. We worked 14 hour shifts to avoid as much interruption for the business as possible. Job consisted of power, lighting, emergency lighting and fire alarm installation. The shopfitting was carried out by LS Shopfitting. More detail to follow. The client requested better lighting for their yards for when lorries were moving around during the winter months and at night. They were also fed up with the constant upkeep of the existing sodium option and were looking for a low-maintenance alternative. We recommended Agron LED 150W flood lights to provide better illumination, this came with a 5 year warranty. We used the existing power which we could isolate individually by removing the fuse in the base of the pole or from the local fuse board. Using a cherry picker and a team of 3 people we completed the work on schedule within 2 weeks. The client was so pleased with the work we carried out they have since referred us to several similar businesses. This type of LED lighting is perfect for use in car-parks, car showrooms, farms, warehouses, garages, schools and a whole host of other commercial and public areas. 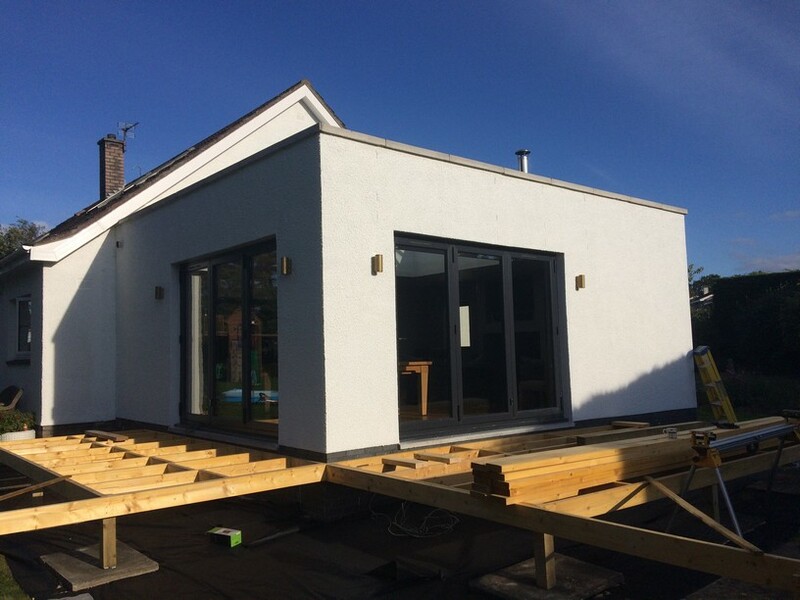 These pictures show the finishing touches to a house extension in East Lothian. The client wanted some colour and design to their newly created space. We came up with this creative lighting option which wasn't too expensive but provided the wow factor the client was looking for. The light fittings are LED and are hooked up at various usable spaces around the room. This 55" TV installation was carried out at Michael Laird Architects in Edinburgh. The client wanted to create a boardroom that was suitable for presentations and meetings that utilise modern technology, including a 55" television and full compatibility with laptops and iPads. We provided multiple connections for laptops via an HDMI connection fed through a floor box under the desk. We also set-up iPads to connect to the Apple TV and supplied power and the internet connection for the TV to ensure full Smart TV functionality. All cables were concealed within the walls and under the floor, which was solid concrete, to keep the space tidy and avoid trip hazards. We also organised a plasterer and painter to finish off the job once the electrical work was completed to ensure the space was ready to use straight away. The Confectioner factory was divided into 2 units and an additional 3 phase supply was provided by Scottish power. Our job was to install a new fuse board and migrate existing electrical circuits onto new board and minimise down time for the business. We provided a new isolator and bus bar chamber to distribute the existing 3 phase supplies to the other fuse boards within the property. This was carried out over a weekend to prevent down time for the business. The client requested a light fitting that would brighten up a stairwell that receives little natural light, as well as hanging quite low. We sourced the lighting from a trade catalogue, working closely with the client to establish the style and look they were after. The lights are 3 individual fittings which we installed at different lengths to create the spiral effect for added aesthetic appeal. Garden lighting project in Corstorphine. The client was looking for external lighting that she could enjoy when sitting in the garden. We suggested using led spike lights on the ground to light up the features around the garden and can be directed and adapted as the seasons change. We also installed the lights on a timer and dusk sensor so the lights would come on when it got dark and switch off at the desired time. The work lasted around 2 days from start to finish and was completed within budget.